If it is not clear to you by now, maybe reading this will help. The endgame that is epitomized by the acendency of the current Trump strategery (as we know it) is on a full upswing. The clarity of the global political climate is erupting in a stunning “moment to moment” fashion just a year and a half into the Trump Era. It would seem that in a normal world the end would be near, and it may be. Many reading this today may not remember a world in which the United States was not involved in global confrontation. The famous “shock and awe”, -the Gulf War which many of us in Buffalo associate with the era Buffalo Bills Superbowl campaigns was in 1990. 38 years ago. Even Jim Kelly was a young man then. Not that we had a particulary peaceful relations with the rest of the world prior to that, (The Vietnam War had more or less ceased in 1975 -just 15 years prior) -but the shock and awe of bombing Baghdad ushered a new age of violence and international class-oriented warfare into our lives through cable news, and the emergence of what was then just a nascent internet. This brings us to today. Don’t blame yourself if you are fed up, confused, tired, conflicted, angry, frustrated, and on any given day completely wanting to disconnect from the world that the Oligarch’s empire that we connect to Putin and Trump is suffocating us. Today, as in Vietnam and in prior wars, the hearts and minds of indivicuals and the collective culture is the target. We are in war. You are the target, and the weaponized information armaments connected to your devices and your brains are being detonated with increasingly sophisticated targeting and effect. It is not hard to see this first hand in virtually every conversation, comment, and exchange of ideas. In the next few weeks, leading up to the mid-term American elections, continuous detonations designed to make you fed up, confused, tired, conflicted, angry, frustrated, and on any given day completely wanting to disconnect from this Orwellian world which helped to create World War II will continue to rein down upon us. The intended effect probably has hit you, maybe hit you hard. As we are all intentionally disconnected from our personal spirit, the invaders are actively trying to manipulate us. The American mid-terms are consequential. As Trump faces what may be his final battle with Truth, Justice, and the American Way, instability, enabled by and for the the Trump masters, is a strategic tactic designed to get to the end game. The end game is the end of western democracy, freedom, and the governance experiment started by the Declaration of Independence, the Constitution, The Revolutionary War, and fought for generations with the blood and endurance of patriots. Certainly this game, designed to relieve the majority of the human race of choice, liberty, and a just future is reaching a prominence. Wearing us all down is a strategic concept that will ultimately decide our fate, individually and as a culture. So if you have any moments of strength, buckle your seatbelts because the ride is going to get very bumpy. The good news is that the experiment that birthed western democracy is resilient. So far, most of our institutional systems are holding and in most senses, that is a good thing. Bending but not broken. We still have for instance the checks and balances of Congress, the Courts, and the Executive. Oh, our media world as we now experience it may be a lost cause, but things could be worse. In the context of warfare, fake news is a constant, and has been one of the most influential weapons. Media literacy is as important now as it has ever been. So, continue to be vigilent. Fake news connections through, for instance the Fox empire, in which Rupert Murdoch family is close to Putins family, which is driven by Oligarch crime and planned disparity and in which the whole Trump tweeter message thing descends, can not survive. Not if the western democracy experiment is to survive. Stay strong, as they say. In what some of us consider a surprise move, the New York State Public Service Commission voted last week to order Charter Communications, the owner of Spectrum Cable, to cease operations in New York State. Accordeing to the regulators, the company has failed to live up to its promises under which the State of New York approved Charter’s merger with Spectrum. Charter Communications has been one of the United State’s largert internet operators and offers cable, broadband, and phone service throughout New York Stat, including Buffalo. We recently wrote about the decision in Buffalo to move the important public, government, and educational access channels from the top tier of stations, to the wilderness. Today, if you want to and clearly most have no idea how to find them, the Buffalo PEG channels can be found in the 1300=1304 range with some seperate educational programming be offered through the access context by WNED. More or less. Charter has been asked to file a plan to address the Public Service Commissions concerns within 60 days. Charter has said that it will appeal the order. Back in the more innocent times of spring and summer of 1983 I was living in a cabin, on a pond in rural Wyoming County with my new family. We were adopted by a baby Canada Goose, whom had misplaced its original family. 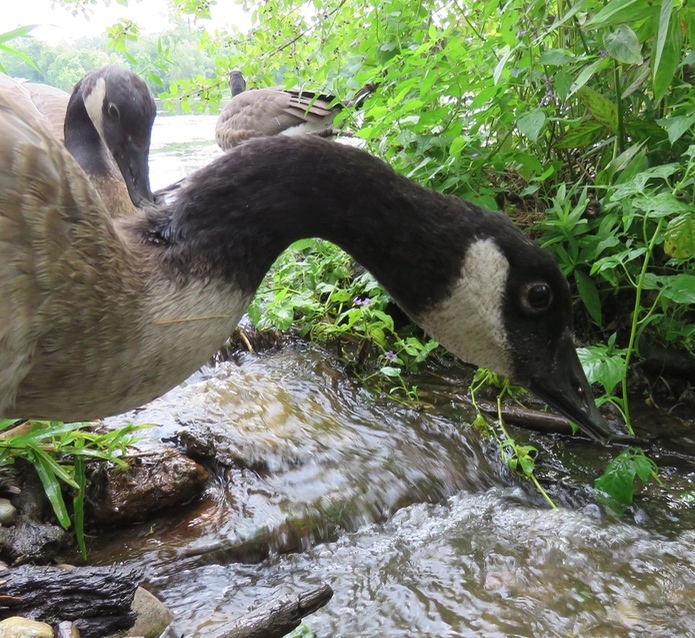 For months, this baby to adolescent to adult goose spent every waking and sleeping moment with us. While we resisted it moving into our cabin, we made space for it on our porch. It accompanied us on long walks in the woods, sat and preened with us by our campfires, and constantly chortled and sang to and with us. It swam with us as we kayaked and canoed and swam. It learned to fly by chasing us off our long dock and as we ran and jumped into the water, it gradually learned to lift off and fly. This was great entertainment for all involved and great family building. Eventually, late that fall, our goose flew away with other Canada geese. This past week I visited Sinking Pond in East Aurora. While walking along one of the trails I spotted several dragonflies and butterflies near the shore edge, right were a little stream emerged from the pond. I ventured out to take picures. Suddenly I was surrounded by several small geese that came off the pond, down the stream and up to me. For the next half an hour these little geese reacted to me as if they knew me well. And they were making the intimate little chortling sounds that I remembered and had not heard much since that incredible summer of 1983 when we had been adopted by our little goose. Here is the video. Oh, and there is a Bluebird involved also.